Today’s Work it Wednesday has mostly been about orders orders and more orders. It always feels good to (almost) clear the decks. 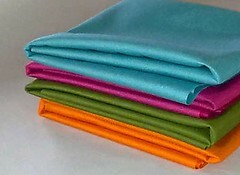 Sales of my grosgrain lining fabrics are going ok. I’ve not spent any time promoting the fact that I’m selling fabrics (except for a mention here and a quick slot on my facebook page), however, encouragingly people are starting to find me and a few sales are starting to trickle through. It was a lovely day today. I am really enjoying the ever so slightly warmer weather (a few degrees can make all the difference) and the odd patch of sunshine here and there. 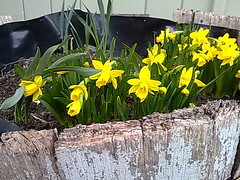 I even noticed that some of the daffs have popped out today to say hello. 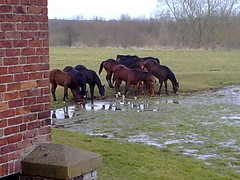 The horses have also arrived in the field next door. There are currently 12 of the youngsters, but I’m sure there will be more to follow as the weeks go by. I think last year it got up to 22 of the frisky fellas! We do live in a fabulous spot and are very lucky to have such a great view. There are also two very special Birthdays today….Happy Birthday Dad and Happy Birthday Connie.